I’ve recently read several blog articles about language use in historical fiction. These writers take great pride in their efforts to use vocabulary, sayings and syntax to establish their story’s manners, mores and customs. They delve into novels, letters, news articles, chronicles, public records, anything they can find from the period in order to provide an aural immersion experience for the reader. These are high goals. And, of course, few of us have the patience to read Old English. I haven’t read works by either Mr. Colton or Mr. Wilson but I trust they have learned to balance today’s reader expectations and pace with their immersion research. My next post will address my own challenges in this area. Meanwhile, what are your favorite examples of historical fiction that best reflect the language of the period without getting bogged down for today’s reader? What are your favorite #Histfic reads that best reflect that period’s #language usage? Sara Gruen’s new book, At the Water’s Edge (Philadelphians pursue the Loch Ness monster – World War II) debuted this week at No. 12. That makes it past time I complete this post that’s been simmering in draft mode for months. I finally read Water for Elephants last winter. I know I’m swimming against the tide – again – but I didn’t really get the excitement over it. I’ve not seen the movie, but I imagine the potential visuals were a strong driving force for the project. But the main story? Meh. Sorry, I didn’t find it that interesting. It was just a love triangle set in a circus environment. The lesson here might be that great word-crafting and an exciting context still requires a compelling story with compelling characters. Of course, the book received endless 5-star reviews. So what do I know? But I find it interesting that the critical movie reviewers complained that the two lovers lacked chemistry on screen. There might have been any number of causes: the acting? the directing? the screen play? the editing? But, I found the same problem in the book. The characters didn’t make me care and so I wasn’t convinced all the drama was worth it. However – really big however – the circus story is narrated by the main character, now a nursing home resident. This character – present-day Mr. Jacob Jankowski – made an immediate, deep and lasting impression on me. At 90+years-old, Jacob is fighting for self-determination. His nurses are kind and do their the best for him. They are trying to keep him out of trouble; keep him from danger. But he longs for freedom and he proves that he is capable of much more than they are comfortable with. No doubt they have residents with varying abilities, and so, like all institutions, they must standardize and systematize, reducing everyone to a lower commonality or else they would be undone. But Jacob clings to every last bit of control he can grasp. The Take Away – I am helping my parents make the continuous adjustments that come with growing old: Dad no longer drives. Mom got rid of all their glassware. Throw rugs are gone – taken up to prevent falls. And now we are working to get them moved from ten hours to ten doors away. 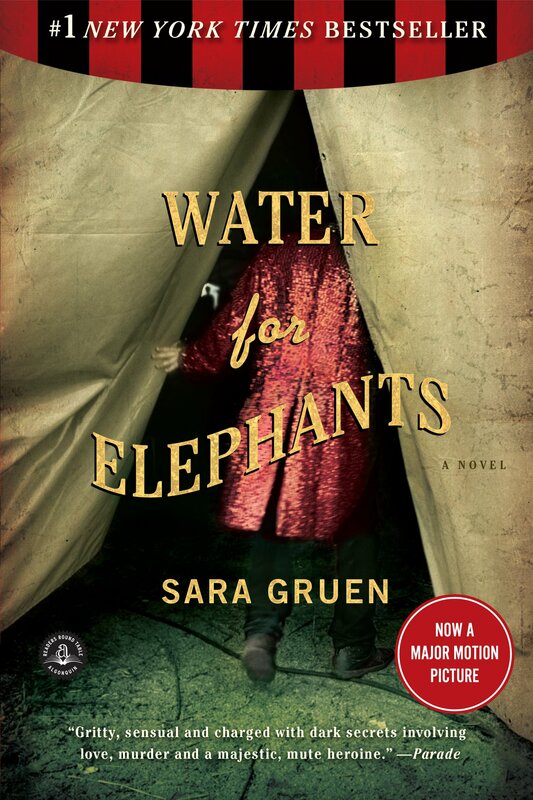 Water for Elephants sent up all sorts of flashing lights for me – not circus lights, warning lights. And they continue to flash every time I am about to make a decision that affects my parents’ lives: Am I making a decision for them based on my own preferences? Is this choice something they can and should still make for themselves? What do THEY want? Jacob constantly reminds me: Let them have a say in every possible decision. There will be enough, and increasingly, fewer choices for them. Stop first and consider: Is this a question of danger in any way? If mom wants her new walls painted marigold when I would use a cooler color – what’s that to me? Find every opportunity to let our elders retain their self-respect and determination. Would I read more from Ms.Gruen? You bet. In a prior post I explained that I do not intend to write proper reviews of books. I also mentioned that for a book to receive five stars from me, it would have to be more than entertaining and well written. It must also stick with me past the final page. Some books are technically perfect but forgettable. Others are unforgettable but could do with another hard edit, or they have some niggling thing that prevents the perfect 10 in my eyes. And, as I explained, trying to review books as a beginning novelist just feels awkward. I don’t generally read reviews either. When I choose a book (or film) I like to know as little as possible before I begin. I don’t even read back covers. Writers work incredibly hard to create a story that unfolds and reveals information in exactly the right way. I hate to miss that experience by knowing anything before the writer wants me to. Tell me the genre and the period and that you recommend it – let the writer do the rest. However, I would like to use this blog to make observations about various books and invite dialog on certain aspects. Which brings me to these thoughts about My Name is Red. My Name is Red appears on many historical fiction “must read” lists and is set in a time/place which is well off the beaten path. So it seemed a good candidate for a lover of long ago and far away tales. Also, although 16th century Istanbul is many hundreds of years and miles from my current period of study – for my interests, that’s really close! This murder/mystery was written in Turkish by Orhan Pamuk, winner of the 2006 Nobel Prize for Literature. With all the accolades, I figured I’d better read this and was excited to find something so intriguing. Many aspects of the book appealed to me: as an artist, I loved that the story is set among a community of miniaturist painters; the structure, voice and non-western worldview is compelling; the characters are complex and therefore unsentimental in their portrayal. But I felt vast portions of the book were repetitive and going no where, slowly. I could have enjoyed more of this world, these characters, if it had been additional material rather than the feeling that I was going in circles. By the time I was done with it, I was relieved. And finding out the answer to the whodunit was, meh. But here’s additional support for why I won’t formally review this book or others. Sometimes it is only after time and distance that the true impact of a book is realized. I am now 5-6 months from finishing that slog but find the book is still with me. Something of it’s essence lingers. What is it and why? I’m not really sure. I think a large part of it is the believability of the characters. They were just fickle, inconsistent and imperfect enough to truly breathe. One intellectual question persists – I wonder if I were capable of reading the work in the original language, would the word crafting have extraordinary merit? Is it more beautifully written in the original? Did I miss some important aspect of the work by reading a translation? This question buzzed around my head while I read the book and resurfaced when I read the article in the last Historical Novel Review, “Translating a Genre” by Lucinda Byatt. Ms Byatt makes a great argument for more historical fiction to be translated into English (Hear! Hear!). She also notes the difficulty for publishers to be sure of their translator’s skills. I couldn’t possibly critique Erdag M. Guknar’s translation of My Name is Red, but I can’t help wondering if I’ve missed out on something in the writing? This book is also steeped in historical references that are probably familiar to eastern readers but are well outside of my exposure. It was fun though, just today, while readingThe History of al-Tabari for my own research, to come across the historical account of Shirin and Husrev, who’s love story figures so prominently in My Name is Red. I felt like I’d run into an old acquaintance. I get the feeling that My Name is Red opened my mind to things I have yet to realize. The more reason not to rattle off hasty book reviews using the grade-inflation-tainted star system. I’d love to hear from others who have read My Name is Red and your reaction to it. Is it just me? How do you feel about official/starred book reviews? Since I am writing historical fiction, it follows that I would read as much as possible in the genre. I am really trying to catch up. In order to be well-read in historical fiction, one must read Sharon Kay Penman. So, I think I spent most of 2013 making my way through her Plantagenet Series – When Christ and His Saints Slept, Time and Chance, and Devil’s Brood. These books are massive but took me even longer because I found myself avoiding them – especially Devil’s Brood. Don’t misunderstand me – Ms. Penman is brilliant. 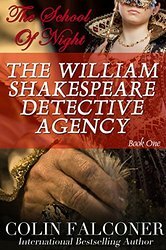 Her writing is dense with historical detail and her character’s are as real as you and I. But I found myself wanting to slap nearly every one of them. Page after page of family squabbles result in the burning and pillaging of the French and English countryside for decades, generations. I found myself aimlessly surfing the web or scrolling through Facebook again just to avoid these people. What’s more amazing is that I liked most of the characters – even as I wanted to spank them. 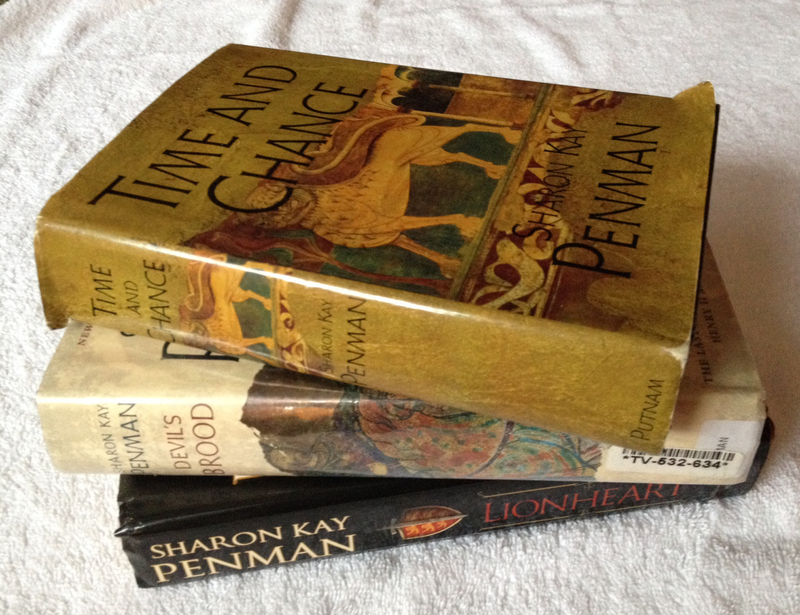 Penman’s Lionheart – the story of Richard – sits on my dresser, but he will have to wait. I need a breather from these spoiled brats. It reminds me of trying to read Barbara Tuchman’s A Distant Mirror while living in Indonesia. I got through about half of it and couldn’t take it anymore. In this narrative history of 14th century Europe, Tuchman repeatedly points out that the rulers wreaking havoc on ordinary folks’ lives were really just teenagers run amuk. I felt like I was watching the same nonsense in Indonesia at the time and so put the book down. Why torment myself? I suppose that’s somewhat the point in both works: people don’t change. Given the opportunity, a world run by teenagers will pretty much look like medieval Europe. Thank God for democracy. Let’s keep it that way.